A third of transgender students have attempted suicide in the past year, figures released on Thursday (24 January) indicated. For the first time, the Centers for Disease Control and Prevention (CDC)’s Youth Risk Behavior Survey (YRBS) included an optional question in which students would be able to express their gender identity. Ten states (Colorado, Delaware, Hawaii, Maine, Maryland, Massachusetts, Michigan, Rhode Island, Vermont, Wisconsin) and nine large urban school districts (Boston, Broward County, Cleveland, Detroit, District of Columbia, Los Angeles, New York City, San Diego, San Francisco) agreed to include the question in the 2017 survey. Almost 2 percent (1.8 percent) of the 131,901 high school students surveyed identified as transgender and, among these transgender students, 34.6 percent reported having attempted suicide in the past year. The same percentage (34.6 percent) reported being bullied at school. The survey noted overall higher experiences of various forms of violence, from sexual abuse to physical violence, among transgender students compared to their cisgender—who identify with the gender assigned at birth—peers. Transgender students also reported higher levels of substance abuse, particularly alcohol and marijuana. The CDC survey did not examine possible causes for these findings, but researchers advised “taking steps to create safe learning environments and provide access to culturally competent physical and mental health care” as measures to improve the care for transgender students. LGBT+ activists have commended the government organisation for including a focus on gender identity. “In order to make policy changes, we need to have hard numbers to point to,” said Caitlin Clark, a research associate at GLSEN, a national nonprofit championing a supportive school environment for LGBT+ students, quoted in NBC News. The Trevor Project, an organisation dedicated to providing LGBT+ youth with mental health support including suicide prevention, called the survey “game-changing” in a statement to the press. 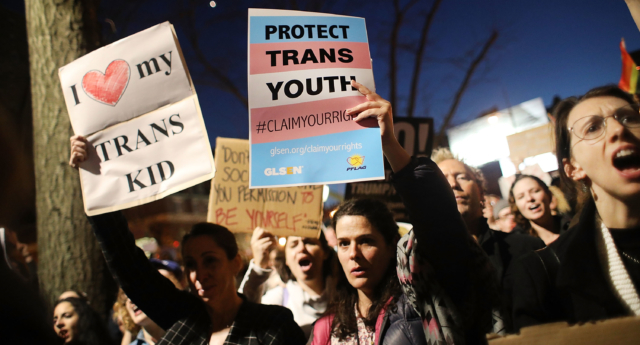 “The CDC’s findings highlight the need for even more policies to protect transgender and gender nonconforming youth,” commented Amit Paley, The Trevor Project CEO and executive director. Paley continued: “Now with inclusive health data that reflects the wide spectrum of gender identities, The Trevor Project can better inform its suicide prevention, risk detection, and response programs.